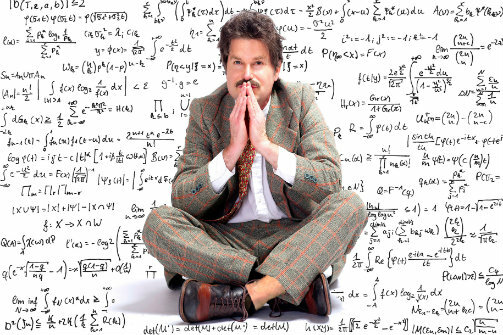 Theatre Is Easy | Reviews | Einstein! Jack Fry in Einstein!. Photo by Jesse Ashton. BOTTOM LINE: Einstein! is a faithful and entertaining representation of years of research that will leave you satisfied about knowing a great man more intimately. Teachers who add a little dramatic flair—putting on a toga to read Socrates, reading a picture book “with the voices,” pulling out the guitar—create lifelong memories. Einstein! riffs on that theme, working in the truest theatrical sense to strengthen the audience’s connection to the great Albert Einstein’s personal struggles, passion for his work, and awe of the universe. Jack Fry will remind you of your coolest teacher ever as he portrays the emotional life of one of the world’s great minds with humor and sensitivity. John Toom’s set design is notably well done for a Fringe production: a roughly-period 1914 office environment with the appropriate furniture and dressing. When period-appropriateness wavers, a classroom appears (the appearance of a Composition Notebook for Einstein’s notes drew smiles). A projection screen hangs at the back of the stage, and is well used throughout to provide edu-taining scientific graphics and a backdrop for scenes in remote locations. The multimedia elements add a youthful, cartoonish factor to the performance: when the audience enters the theatre, they’re greeted by Epic Rap Battles of History’s “Einstein vs. Stephen Hawking,” and a meme-ish photoshopped photo of Einstein with formulas swirling behind his head, complete with a white-text “EINSTEIN!” overlaid on the image. Assistant director and vocal coach Peggy O’Neal has obviously taken some pains to find a happy balance between the heavy accent that Einstein clearly displayed in his recorded English speeches, and a speaking style that is sustainable and undistracting to contemporary audiences. That being said, some technical detail is lost in Fry’s breathless dialect as he interprets the German’s more excited descriptions of relativity. Fry steams through these passages with the relentlessness of a teacher unwilling to lose his students’ focus, when perhaps he might be better understood after a deep breath. Otherwise Fry’s empathetic interpretation of the character shines with, well, gravity—most notably the times when Einstein reflects on science’s place in the universe, and his own family life. This show does exactly what it aims to do: emotionally connect its audience with a figure more admired than understood. Fry creates an easy, bantering rapport with his audience that keeps everyone engaged and on their toes in the small space. It’s a fun and educational night by a skilled and faithful team. Einstein! is written and performed by Jack Fry. Directed by Tom Blomquist. Assistant director and vocal coach is Peggy O’Neal. Set design by John Toom. Stage Manager is Cody Andersen. Physicist adviser is Ron Mallet. Voice of Mileva is Alexandra Kovacs. Graphics by Walker Schupp and Anthony Denha. Production assistant Matt Sibley.